A roadside barrier is never “safe”. They are best described as “less dangerous” than whatever they are meant to protect the road user from. 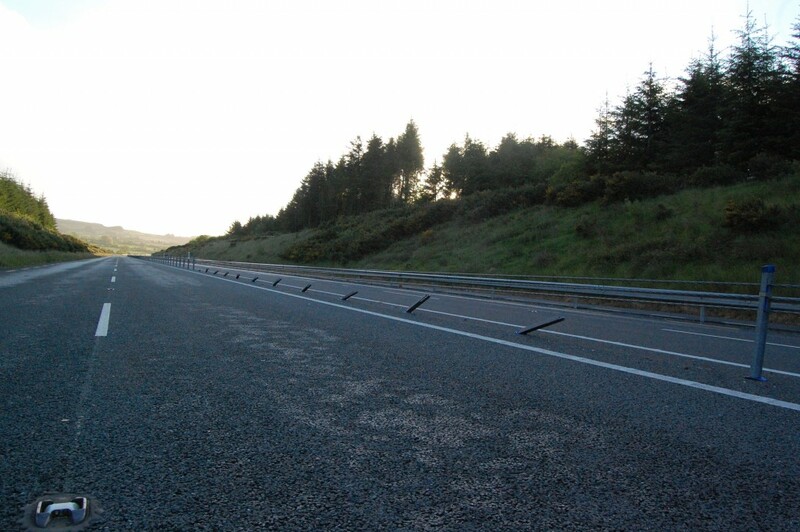 We’ve long complained about the use of wire rope barriers as a carriageway divider on motorways and dual carriageways. They are lethal to motorcyclists not just because of the “cheese cutter” wires (although these are bad enough) but because of the exposed upright posts. It’s hard to imagine anything more likely to cause injury to a sliding rider in the immediate aftermath of a crash than a series of sharp steel posts. This photo was taken by Gerry Christie and demonstrates a serious hazard that exists on the Castleisland bypass in three separate locations. Gerry tells us that “these supports have been like this for weeks if not months”. This is completely unacceptable on any road and MAG Ireland has already been in touch with the relevant authorities to demand remedial action. We’ll let you know how we get on. Update: We are informed that the barrier has since been repaired.